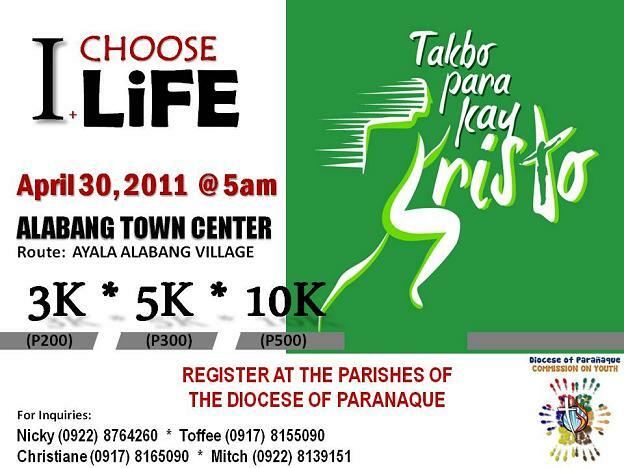 Takbo Para Kay Kristo II - I Choose Life is a fun run advocating Pro-Life which will be held on April 30, 2011, Saturday at 5am. Our targeted 3,000 runners will come primarily from the areas of Muntinlupa, Paranaque and LasPinas. The assembly area, start/finish will be at the Alabang Town Center (parking lot facing Rustan's) The course will run through the Ayala Alabang Village. dude on stage without a guitar, announcing, "I'm a virgiiiin!!!"